Tanabata, also known as the Star Festival, is a Japanese festival that celebrates the meeting of the deities Hikoboshi and Orihime. The date of the celebration may vary by region, but the first festivities typically begin on July 7. The Tanabata festival originates from the Chinese Qixi (Qiqiao) Festival. It celebrates the annual meeting of two star-crossed lovers, the weaver girl and the cowherd. According to legend, their love was not allowed, thus they were separated by the Silver River. The lovers can reunite once a year, on the 7th day of the 7th lunar month. The Silver River symbolizes the Milky Way, and the lovers are represented by the stars Altair and Vega. The festival was brought to Japan by Empress Kōken in the 8th century. In Japan, the weaver girl's name is Orihime and the cowherd's name is Hikoboshi. The original date of the holiday was based on the lunisolar calendar used in Japan at the time. When the Gregorian calendar was introduced in the country, the date of Tanabata was moved to July 7, as it is the 7th day of the 7th month in the Gregorian calendar. However, in some regions it is celebrated in August, closer to its original date. 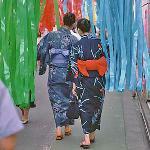 The scale of Tanabata festivals in Japan vary by region. Most festivals involve decoration competitions, parades and carnival games. Many people celebrate Tanabata by writing wishes on small pieces of paper and hanging them with on bamboo, which is burned or set afloat when the festival is over.